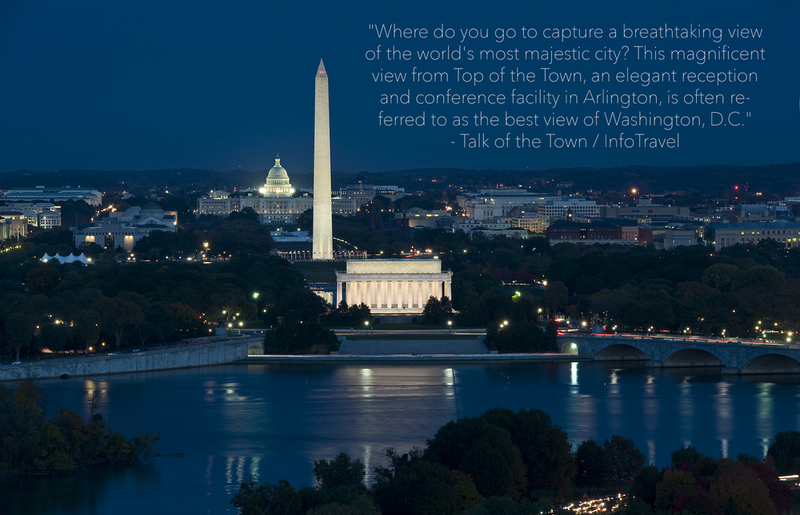 Top of the Town, featuring a breathtaking, panoramic view of the Washington, D.C. skyline, is a reception and conference facility specializing in wedding receptions, banquets, and other private functions as well as business conferences and meetings. The Top of the Town space, which had been a restaurant from the mid 1960's until 1991, was completely gutted in 1999 and built-out to include 10 foot wide windows, an approximately 3,000 square foot, fully equipped reception room, as well as a large outdoor terrace. Since opening for our first private event, we have seen thousands of people marvel at the extraordinary view of our Nation's Capital. Our staff is dedicated to accomplishing one magnificent event at a time. We look forward to working with you to create your extraordinary event! We are conveniently located in the Rosslyn area of Arlington, are minutes away from downtown Washington and Reagan National Airport, and are walking distance to the Rosslyn Metro Station.